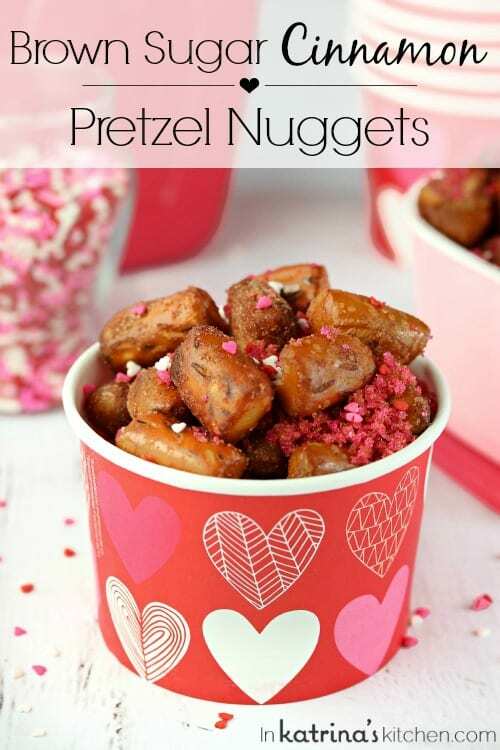 Make these Brown Sugar Cinnamon Pretzel Nuggets for Valentine’s Day, Game Day, or any day. No-bake, no-fuss, this addicting snack is ready in less than 15 minutes! Warning: This sweet and salty snack is highly addictive! It’s so delicious that I had to make it twice because the first batch disappeared overnight. I seriously woke up with plans of photographing these little crunchy, cinnamon-y nuggets only to be greeted with an empty container. It’s a classic recipe that I’m sure you’ve enjoyed at some point or another, and now you can print it, or pin it, or tuck it away just for yourself so you’ll never be without it again. But just promise me that if you pin it on Pinterest you will actually make it! 😉 Anyone else guilty of pinning allthethings but rarely returning to your boards and crossing some recipes off your list? I actually sent my husband my I eat Lunch and Dinner Board with specific instructions for him to email me a link at least once a week of something that he wants to see at our dinner table. If your husband is like mine he may have no concept of what Pinterest even is, but he can point to what he likes. 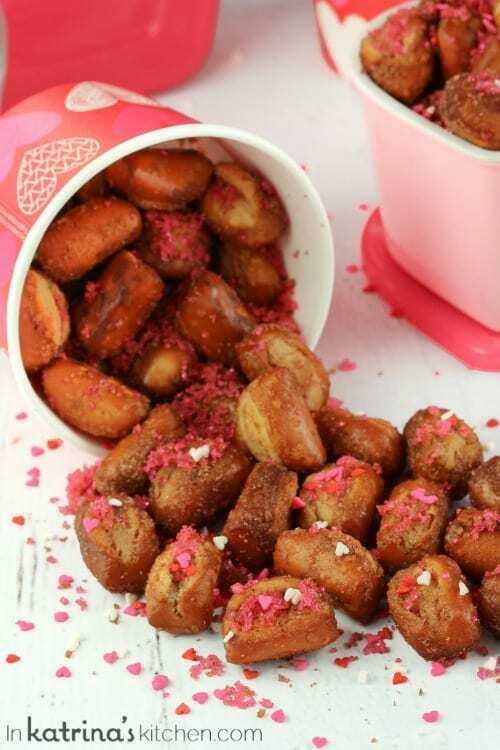 I made these little pretzel nuggets with brown sugar and cute sprinkles, but feel free to use white sugar and omit the fancy sprinkles if that’s more your style. But don’t skimp on an extra dash of coarse salt at the very end if you like sweet and salty snacks. YUM! 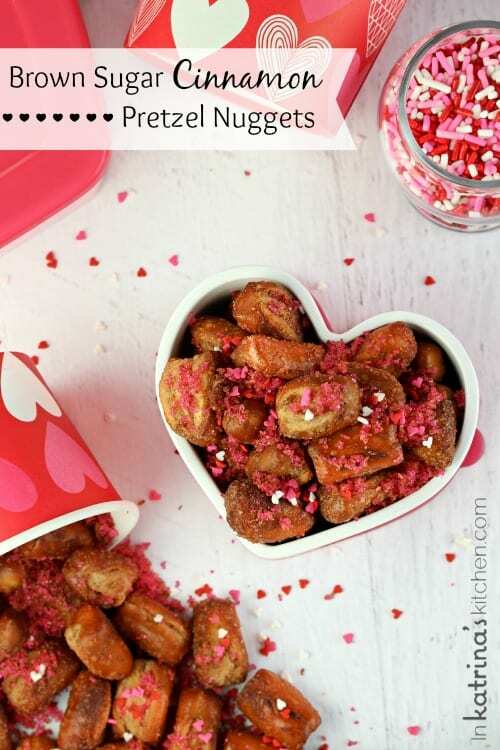 Make these Brown Sugar Cinnamon Pretzel Nuggets for Valentine's Day, Game Day, or any day. No-bake, no-fuss, this addicting snack is ready in less than 15 minutes! Combine oil, brown sugar, and cinnamon in a small bowl and stir. Empty pretzels into a large microwave-safe bowl. Pour cinnamon sugar mixture over top. Mix to coat pretzels. Sprinkle with up to 2 Tablespoons pink sanding sugar and sprinkles if desired. Microwave on high power for 2 minutes. Stir and repeat. Lay out on a flat surface (parchment or foil-lined baking sheet works well) to cool. Sprinkle a dash of coarse salt all over the pan. Store in an air-tight container. You can sub white sugar for brown sugar if desired. Recipe can be baked on a flat baking sheet at 200°F for 10-15 minutes if you do not own or use a microwave. Eee!! These are so cute! I would love to have a big bowl of these on V-Day! 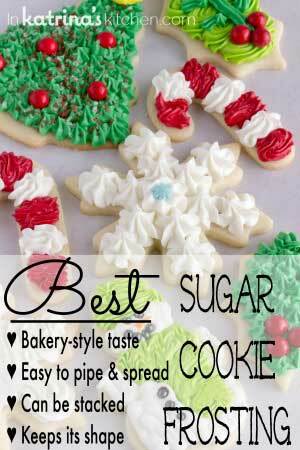 Sweet and salty is a favorite of mine-love how easy these are! Pinned! Thanks Lisa! You will love these. We’ve had it many times with white sugar too, but brown sugar pairs so well with cinnamon, you’re right! 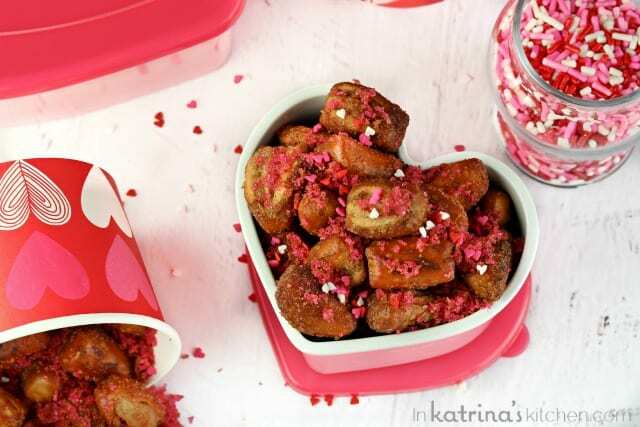 Sweet and salty and festive Valentine’s Day-y? I’m SO there. Can’t turn down a sweet and salty snack like this! So festive and so addicting! Seriously sweet and salty gets me every.single.time!!!! Ahhhhh, I’m pretty sure I could live off of these! Want, want, want. Now, please. This is so my kind of snack! Oh, this here recipe is gonna happen. I’m gonna make it rain cinnamon-y pretzel nuggets. Love everything about this recipe. These look tooo good to ignore. 😉 I wonder if they’d survive intact if I shipped a batch to my college guy for V-day? Hmm. These would totally hold up to shipping! I hope your guy loves them- and shares at least a few with some friends! Guilty! I pin and yet never getting around to the actual making because there are too many to choose from. I like your idea of having someone else choose! SO GUILTY! Yesterday, I went through my entrees board last night and picked out two dishes to try next week. Pinterest can be inspiring, but I’m excited to actually make something from it again. It’s been a while. 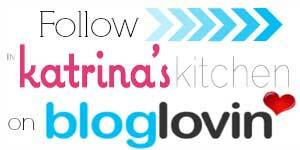 Speaking of pinning and making things…HOLY COW Katrina. 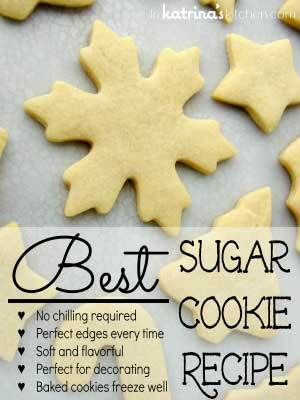 I’m almost afraid to make these because I know the second I do, I will inhale the entire batch! These pretzels look so yummy.Great for camping.Will try them and report back to you. These pretzels look yummy.Great for camping.Will try them and report back. Oh, Katrina. I want to punish you for making such an incredibly addictive snack mix, but then I’d be lying to my soul. I WAAAAHHHHHNNNNTTTT. I love your comments every time. That is all. 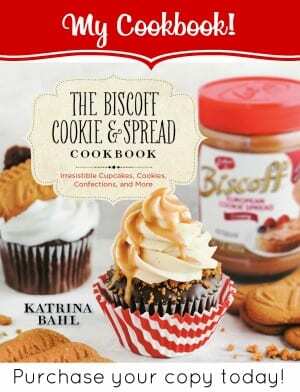 I will be making this for my Bunco group next week. Just completed 4 batches for V-Day treat bags. The recipe calls for 2 Tbl sprinkles and sugar, so it wasnt clear whether to use 2 each? I didnt see enough heart sprinkles in the end results so I added enough heart sprinkley love to last till the next holiday! I will try with bigger sprinkles next time. Lots of sugar/sprinkle crumbs left so I dumped thkse in the treat bags too. I used 2 Tablespoons total. It’s just a matter of preference if you like more hearts go right ahead!! So I’m pretty skeptical about recipes in which the chef claims that the final product is so delicious that they could not contain themselves. I’m here to tell you that my skepticism was completely unfounded when it came to this recipe. Totally brilliant. Yesterday, I was browsing the internet for a simple, easy snack recipe to take to a Game of Thrones season premier party. These seemed perfect, since I knew that other guests were bringing chips and dip. The recipe was SO quick and easy that it took more time to walk to the store than it did to prep these pretzels. I will admit that I did add additional sugar, honey, and pumpkin pie spice to taste. I wasn’t sure what to expect when I took these to the party. I only ate a few myself (and I can assure you that they were quite delicious), but the real test was that they were the only snack completely gone by the end of the evening. I also had at least 5 people ask me for the recipe. These are a total winner. 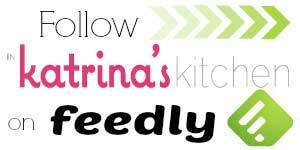 Thank you so, so so much Katrina! Ha! Thank you for letting me know! I am serious when I said I had to make this 2 or 3 times before I could snag some photos of it. My family just kept gobbling it up! i don’t have canola oil…..would vegetable oil work? I’m also curious about a Canola Oil substitute. Would it be on to use EVOO or Coconit Oil? These look delish! !